It's always wonderful to hear from a customer who bought a piece of pottery at a fair; better yet when they send a picture. 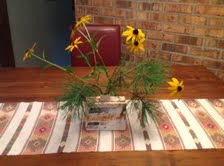 When I got home from the Lucketts Fair this evening, an email with photo was waiting for me -- the vase was purchased this afternoon and immediately put to good use. Thanks very much Margaret for the photo.